Gracious, are eyes being deceived? Is somebunny really posting? The answer is YES! Unbelievable, I know. This naughty bunny has been away because of work and knitting, but mostly I have been away because of Ravelry. 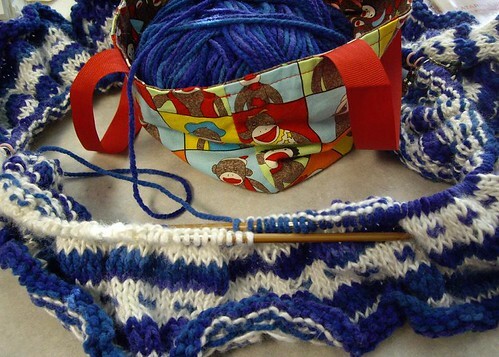 Since joining, I have taken up quite a bit of responsibilities: it began with editing yarn then also editing yarn shop database entries, joining groups to get/give advice, moderating groups (yikes, I have 10 at last count! ), and my latest badge of pride — Ravelry Helper — where I can be found offering tips and tricks in the Lingr Ravelry Help chat room or in posting away in various groups. Whew, I am out of breath after writing all of that! To continue from the last post, besides getting packages from spoilers and swaps, I have been doing my part too. The first I will discuss is the scarf I made for the Ravelry Scarf Exchange, of which I was the spoiler for Heather of “HL Miller” yarns. To say I was a nervous wreck is an understatement! 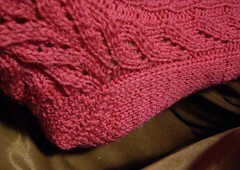 However, I am mighty proud to finally present the scarf I made: WIPing and pre-blocking photos. In catching up on writing, I have to bring some bad news: no more bunny socializing at PetSmart any more. Sweet Binks Rabbit Rescue has decided to pull the potential adoptees out of PetSmart. One of the reasons I understand is that customers will let their dogs jump at the bunnies. I have caught many a person doing that or pounding on the protective glass! 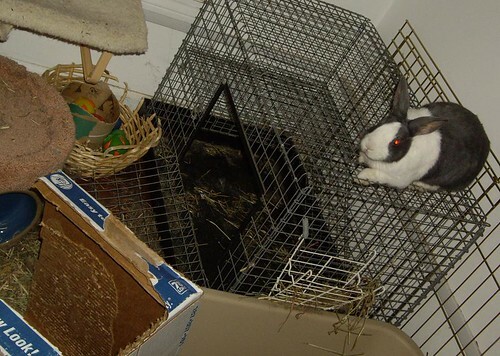 (sigh) I will miss “hanging out” with the buns, but I know it is for their best interest. The end of bunny rabbit photos is not happening though. Here is one that is a story in itself. That cardboard box is one of their favorite toys. I picked it up at BJ’s Wholesale Club during a shopping trip, and it has a grass mat lining the inside bottom. Zy likes to nap in there, and Jessi loves to chew up the sides. However it is supposed to be on top of their play cage in the far corner against the wall. What is not shown is that Zy was also napping about where Jessi tossed the box. She cannot be THAT mad at him! To get to another part of this post, I have had some gentle reminders that people want to know what I am up to these past few months. 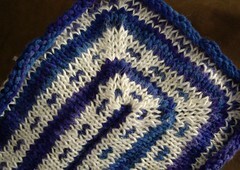 Outside Ravelry, I am knitting in various SNB circles at Borders, Panera Bread, and Yarns at Lace Wings. Besides those groups, I am often found visiting the different LYS in my area to check up on the latest news and fibers. Usually Debbie (calicokitty6 on Ravelry) joins me and after a fun visit with Marva (mickeysews on Ravelry), I can see more of us having a grand ol’ time! Because of the various shops I have visited, my plan is to create dedicated pages about them, so folks do not have to go through the entire diary. One of the first ones will be “Eva’s Yarn Shop” in Fairhaven, MA. Whenever I enter Eva’s, I am immediately cheered up from any unhappy feelings and thoughts! Lots of photos I need to upload from the December Ravelry event — LOTS. 1. Once I start talking, I tend to ramble — especially when I am nervous. 2. When I am really nervous, I drawl. – Link to the person who tagged you. – Leave a comment on their blog so that their readers can visit yours. – Post the rules on your blog. – Tag 7 random people at the end of your post. – Include links to their blogs. – Let each person know that they have been tagged by leaving a comment on their blog. ← Holy Smokes — Merry Christmas!! Welcome back!! You sure have been missed. Thank you so much, though, for all the hard work you are doing with Ravelry. We are lucky to have you keeping things running smoothly.